Groot Constantia’s rich history shows how one man’s love of wine established South Africa's first wine farm more than 330 years ago and how those 891 morgen of land formed the origins of the commercial South African wine industry, with Emperors and Kings such as Frederick the Great of Prussia and Louis Phillipe (King of the French) buying 'Constantia Wyn' at auctions across Europe. South Africa's oldest wine became so renowned it appears in Jane Austen's novel 'Sense and Sensibility' as a cure for a broken heart and is drunk to lift a character’s spirit in 'The Mystery of Edwin Drood' by Charles Dickens. Perhaps it even soothed Napoleon as it was served during his exile on the island of Saint Helena. Arrived at the Cape supply station in 1679. Estranged from his wife he arrived in the company of his children and sister-in-law, Cornelia Six. Back in the Netherlands Van der Stel had gained a solid background in viticulture at his vineyards in Muiderbergh. The art of wine and brandy making he learnt there he would soon implement here in the Cape. A former governor of Ceylon and Council Member of India visited the Cape while recuperating from an illness. He recommended to the Chamber of Seventeen, the governing body of the VOC, that land should be granted to Simon van der Stel. After a visit by High Commissioner Hendrik Adriaan van Rheede tot Drakenstein, Van der Stel received title to 891 morgen (about 763 hectares) on 13th July 1685. The land stretched southwards to the neighbouring free burgher farms of Steenberg and Zwaanswyk and to the north it reached as far as the wooded area named The Hell. It is thought that Van der Stel named the farm after Van Goens' daughter in recognition of his help and support in obtaining the farmland. 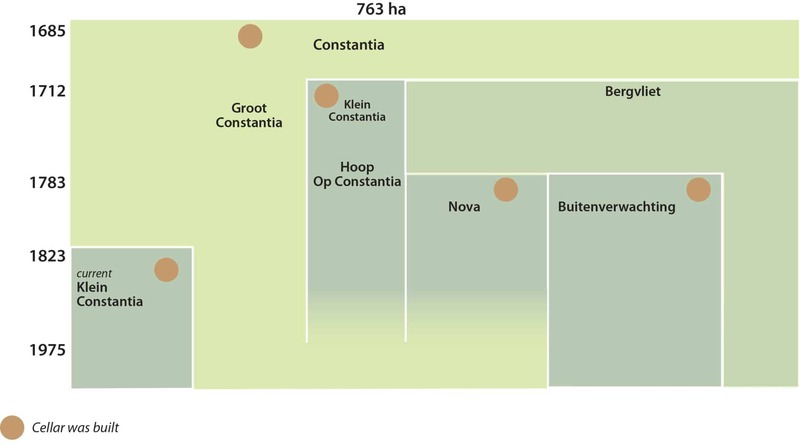 Another theory is that the farm was named after the VOC ship "Constantia". It is most likely that he named the farm after the Latin word for constancy or steadfastness, attributes Van der Stel valued greatly. Appears to have been designed in a late Dutch Renaissance style. The traveller Francois Valentijn (1666-1727) described it as a double storey dwelling with two or three steps leading to a front room or voorhuis, paved with white marble and red stone. There was a big pentagon in the shape of the Castle of Good Hope tiled into the centre of the floor. On both sides of the voorhuis were grand rooms, also with white marble floors. 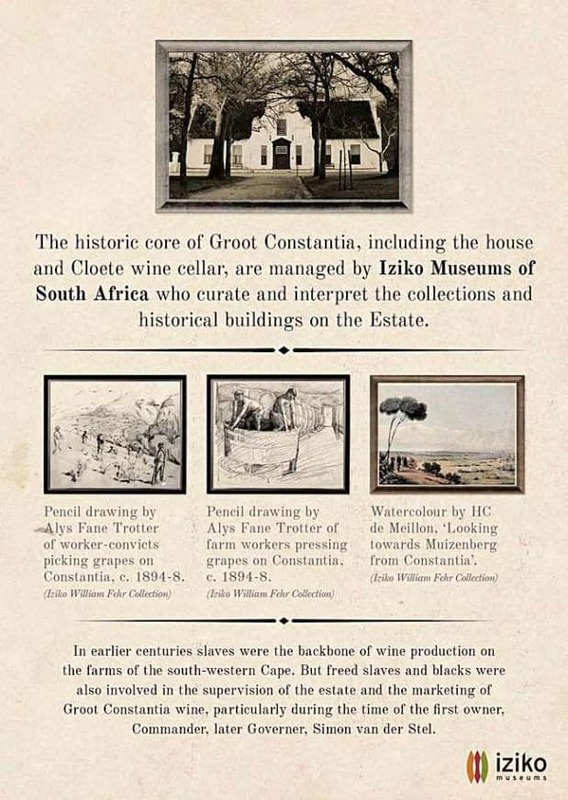 Agricultural activities at Groot Constantia included viticulture and our Constantia wines became renowned in Europe. In 1709 there were 70 000 vines on the farm and Van der Stel produced 5,630 litres of wine. 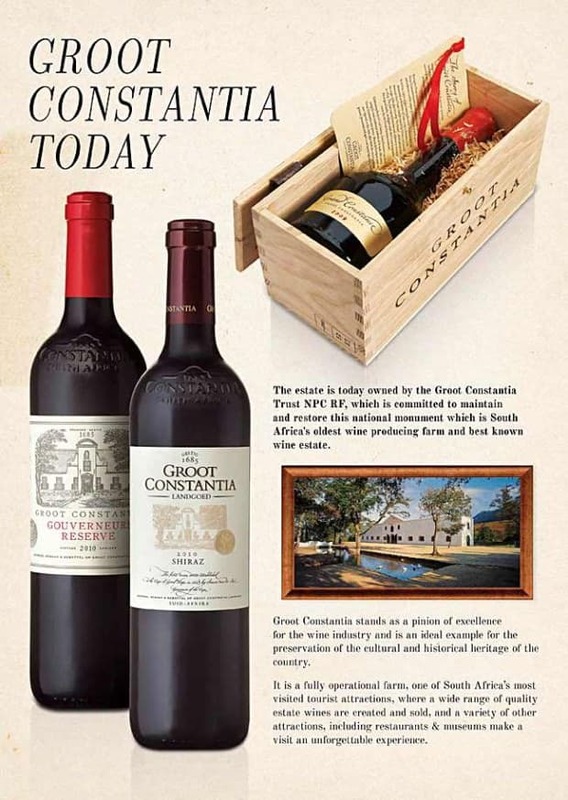 While the ownership of Groot Constantia changed over the years, the legacy and supremacy of the wines produced remained. Despite the size of Constantia, Simon van der Stel seemed to have a big desire for land. In 1693 he acquired the neighbouring farm Witteboomen and in 1699 the farm Boschheuvel (presently Bishopscourt), the latter of which he soon disposed. In 1699 he retired as governor and acquired Zeekoeijenvalleij. By 1709 Van der Stel owned 60 slaves (originating from Bali, Batavia, Brazil, Canary Islands, Cape Verde, Ceylon, China, India, Madagascar, and some of course were Cape born). These slaves worked in the vineyards and wheat and barley fields. In 1712 Simon van der Stel made his last will in favour of his five children. Constantia should be sold two years after his death and some of the slaves were to be set free. Ironically, by 1712 his sons Willem Adriaan and Frans were no longer living in the Cape. In 1707 Willem Adriaan had been recalled to the Netherlands because of his corrupt and monopolistic activities as Cape Governor. On 24 June 1712 Simon van der Stel died at the age of 73. Then in 1714 Constantia was subdivided and sold by way of auction. Pieter de Meijer bought two parts, Bergvliet and Klein Constantia. Captain Oloff Bergh bought the part where the Van der Stel buildings were situated which was later known as Groot Constantia. On 13 November 1716 Oloff Bergh officially took possession of Groot Constantia. He was born in Goteborg, Sweden in 1643. He joined the VOC in 1665 spending a few years as a soldier in Ceylon and arrived as a sergeant at the Cape in 1676. He met Anna de Koningh at the Cape; they fell in love and got married. The union produced 11 children. Bergh must have done very little about the viticulture on the farm. 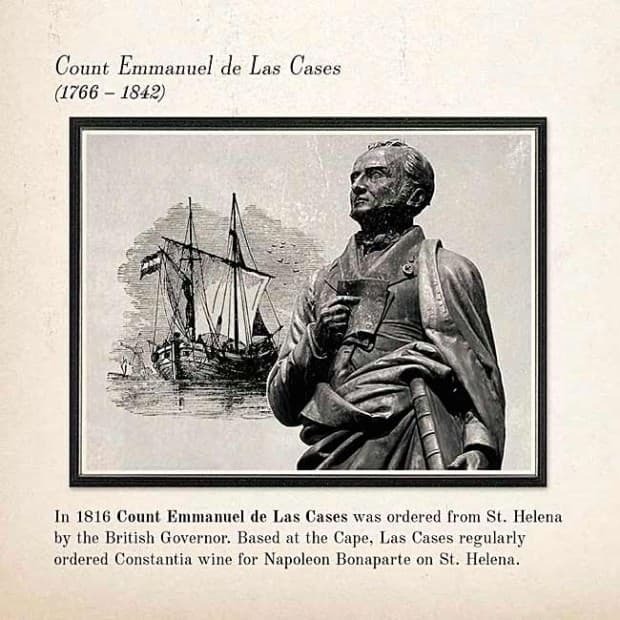 His neighbour, Johannes Colijn of Klein Constantia (later De Hoop op Constantia), produced quality wines that drew overseas attention and became well known as Constantia Wines. In 1724 Oloff Bergh died and his wife Anna de Koningh became the first female owner of Groot Constantia. She was born in Batavia and was one of three children from the slave Angela of Bengal. When she died in 1734 Carl Georg Wieser became the new owner of Groot Constantia on 9 August 1734, he proceeded to further develop Groot Constantia. He increased the viticulture activities and by 1751 had 60 000 vines from which 16,890 litres of wine were produced. Wieser died in 1759 and his stepson, Jacobus van der Spuij, bought Groot Constantia. On 8 June that same year van der Spuij also had to borrow money toward the purchase of the farm and the additional expenses of slaves and wooden caskets. Like his predecessors, he had to supply wine to the VOC, which resulted in financial problems. In spite of this, by 1772 it appeared that Groot Constantia produced a more superior quality of wine to Klein Constantia, increasing the purchase value of their wines. Surprisingly van der Spuij never involved himself with the actual production of the wine; rather he had a slave who acted as cellar master during his period of ownership. On 15 January 1778 the farm was sold to Jan Serrurier– three months later Jacobus van der Spuij died. Hail damage to the vineyards and the resulting poor crop contributed to the poor state of the farm and made the ownership of Serrurier short-lived. Eleven months after he bought it, the farm had a new owner and the fortunes of the farm were to change. In December 1778 Hendrik Cloete, from the farm Nooitgedacht near Stellenbosch, became the new owner of Groot Constantia. The Cloete family lived up to the estate's founder Simon van der Stel's value of constancy, making the estate their home for five generations. Hendrick Cloete was married to Hester Anna Lourens and together they had 11 children. Cloete purchased all the moveable property and the 16 slaves originally belonging to Van der Spuij. He added another 16 slaves to help clear up the neglected farm. By 1792 all the new building work had been completed and after 14 years the farm had been given a whole new appearance. Probably the first building to be erected was the wine cellar. It was set behind the homestead on the edge of the valley aligned with the central axis of the house. The sculpture on the pediment of the wine cellar is believed to be the work of the German sculptor Anton Anreith (1754 – 1822). It depicts fertility and, although Rococo in design, the sculpture blends well with the neo-classicism of the building. The date 1791 on the sculpture could indicate its year of completion, but another theory is that Hendrik Cloete commissioned it to commemorate the excellent grape harvest he had in that specific year. Whatever the reason, it is regarded as one of the most important sculptures in the country. The row of outbuildings in front of the farmstead on the western side is known as the Jonkershuis complex. This is where the "Jonkheer" or oldest son of the farm owner would have lived. However, these buildings probably served as slave quarters and stables, and were most probably called "Jongenhuijs" meaning slave house. They also had wolf-nose gables: the present bell gable changes were made in the early 19th century. The gallery of the Jonkershuis complex was widened and the original flat roofs replaced with a pitched thatch roof. New stone floors were also put in the house, but it is not clear what they looked like. The slender gables of the Manor House were added, as well as the figure of "Abundance" in the niche of the main gable. The ornamental vases on the side gables were also added. As with the wine cellar, Thibault and Anreith are regarded as the architect and sculptor responsible for the work on the Manor House. The oval-shaped pool northwest of the farmstead, with its sculpted figure of "Triton" half man, half fish, son of Neptune was probably built at a later stage. The Inferior quality of its construction in comparison with the farms other buildings point to this. The original "Triton" was replaced with a fibreglass copy in 1985 in order to preserve the original. New vines were also planted to replace the neglected ones and the VOC requested that Hendrik Cloete increase the farm's production. By 1780 he had already planted 10 000 new vines. From 1780 Hendrik Cloete made the wine himself. Apparently his new cellar was one of the best in the Cape. He too had to sell two-thirds of his wine to the VOC, but by 1794 he came to a better arrangement with them. After the British occupation of the Cape in 1795, he had to deliver wine to the British command at the Cape. For Hendrik Cloete, only the name of the wine monopolist had changed. In 1794 Hendrik's wife died and she was buried in the family graveyard at Groot Constantia. Hendrik Cloete left the farm to live at Nooitgedacht where he died, and his younger son, also Hendrik Cloete, took charge of Groot Constantia and became the eventual new owner. The farm “Constantia”, a vast property established in 1685 by the ﬁrst governor of the Cape, Simon van der Stel, was chosen for its favourable soils and mountain slopes gently cooled by the ocean breezes of False Bay. 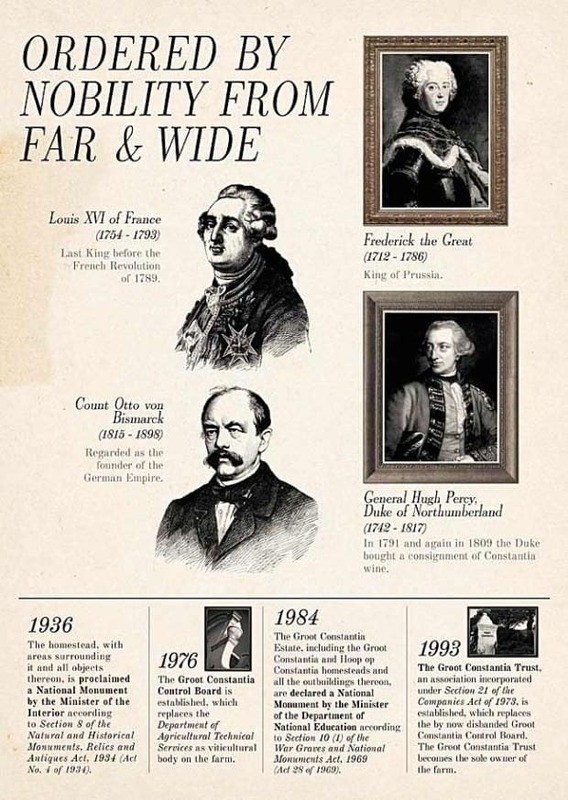 Emperors and kings, from Frederick the Great of Prussia to Louis Phillipe (King of the French) all vied for their share. Charles Dickens celebrated it in Edwin Drood, Jane Austen's character recommended it as a cure for a broken heart to heroine Marianne Dashwood in Sense and Sensibility and Charles Baudelaire compared Constantia wine to his lover‘s lips in his most famous volume of poems, Les Fleurs du Mal. 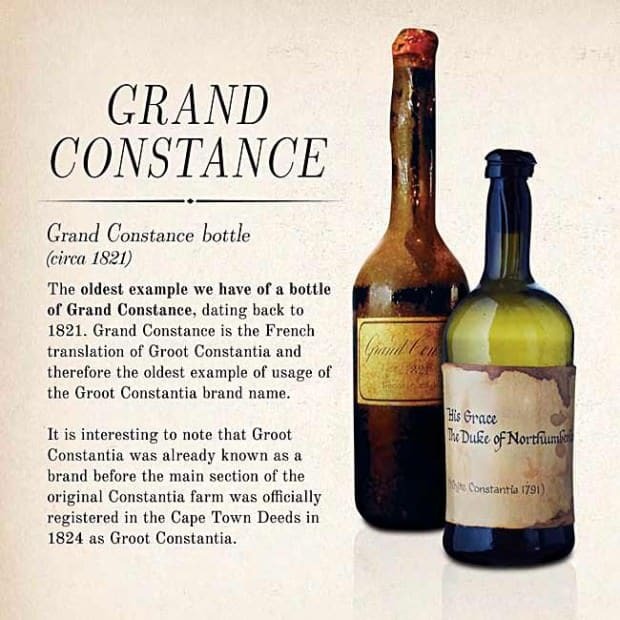 Grand Constance, the French translation for Groot Constantia, was an established brand revered in the time of Napoleon, Louis Phillipe (King of the French) and Frederic the Great of Prussia. 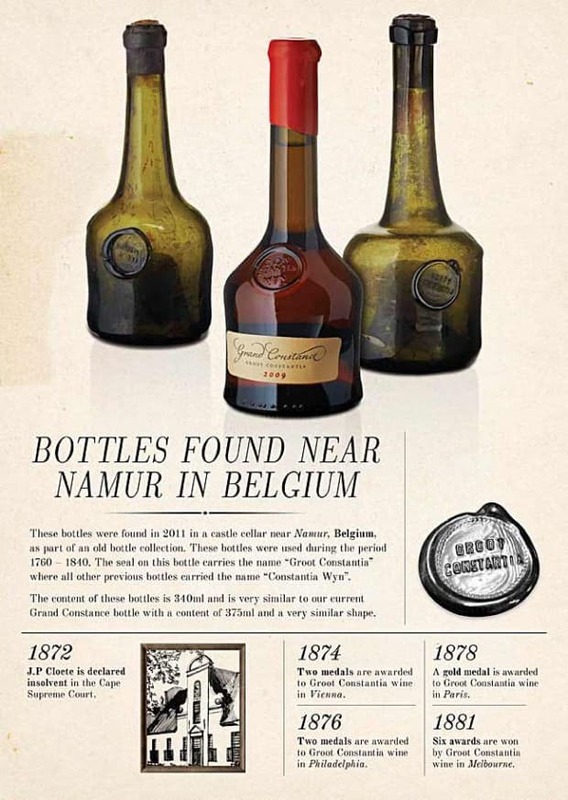 The Grand Constance brand is an important part of World Wine Heritage and South Africa's oldest wine. 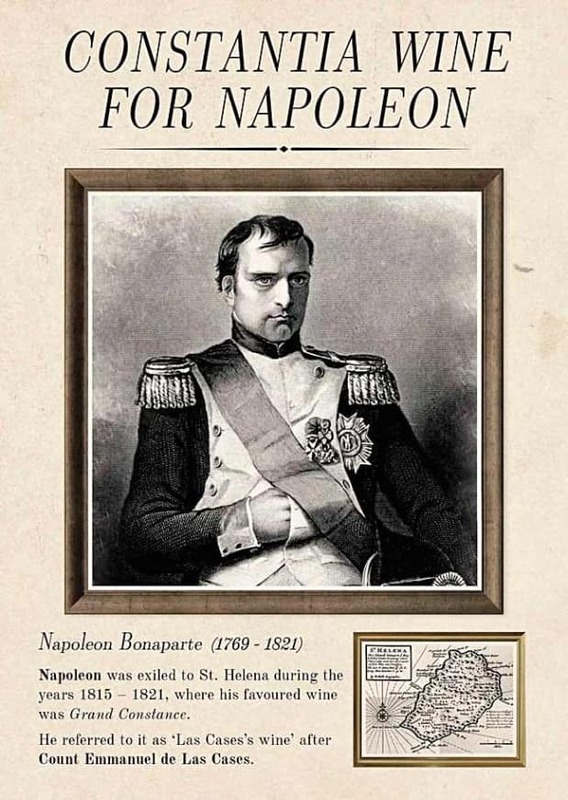 Napoleon was allowed to drink wine made at Groot Constantia whilst exiled on the island of Saint Helena from 1815 until his death in May 1821. The agent of the English East India Company based in Cape Town at the time, Joseph Luson (1783-1822), was tasked by the British authorities to provision not only the French contingent at Longwood House, but also the civilian population, the garrison and the regiments stationed on the Island as well as the ships of the Royal Navy patrolling the waters around Saint Helena. Joseph Luson bought the wine directly from the Cloete family who owned Groot Constantia. His business relations with the family changed significantly on 24 May 1817 when he married Catharina Maria (Mary) Cloete, the daughter of Pieter Lourens Cloete, the wine merchant of Groot Constantia, and his wife, Maria Catharina van Reenen. Luson also appointed his brother-in-law, Daniel Jacob Cloete (1800-1879), as his confidential clerk in 1819. The names of 'Den Heer J Luson' and 'D J Cloete' are amongst the regular clients recorded in the Groot Constantia's Wine Sales Register, meticulously kept from 1800-1860. These wines were all produced and bottled in the famous Cloete Cellar. Simon van der Stel’s magnificent Homestead and the impressive Cloete Cellar still stand today and form part of the farm Groot Constantia, a national monument and still a fully functional wine estate. From plague to fire, the Groot Constantia Wine Estate has faced many challenges throughout the years, but the values of our founder – constancy and steadfastness – have prevailed. In 1859 disaster struck in the form of the wine disease "Oidium Tuckeri" commonly known as powdery mildew. Jacob Cloete's oldest son Hendrik treated the vines with sulphur and partly succeeded in combatting the disease. Phylloxera is a root louse that attacks the “vitis vinifera” grapevines, eventually causing their death. A massive infestation of Phylloxera took place in Europe and America at the same time, destroying millions of acres of grapevines. During the plague it was discovered that America's “vitis labrusca” grapevines were immune to Phylloxera. From that time onwards most “vitis vinifera” grapevines have been grafted onto “vitis labrusca” roots making the vinifera vines highly resistant to Phylloxera. By 1872 Jacob Cloete was bankrupt and could no longer meet his obligations. He appeared in the Cape Supreme Court and was declared insolvent. Jacob left the farm and went to live in Plumstead where he died in 1875. He was buried in the Groot Constantia graveyard. Groot Constantia however was to remain in his estate until 1885. Phylloxera must have been a plague to the Cloete’s for a long time, because in 1875 Henry Cloete left for France to study remedies for the disease. He stayed there for ten years. Henry's son Freddie acted as farm manager, and his son Jacob managed the estate's office in Adderley Street, Cape Town. Henry returned from Europe and it was decided to sell Groot Constantia by auction. On the 1st of October 1885 the Cape Government became the new owner, having bought the farm for a mere £5,275. When compared to the amount of £18,750 paid in 1824, the sad state of the vines on the farm is evident. The Cape Government used the farm as an experimental wine farm. A setback occurred when Phylloxera invaded the farm once again in 1899. The American wild vine stock was used to combat the plague. Just before Christmas 1925 a fire gutted the historic farmstead. This probably saved Groot Constantia because the government was forced to take a fresh look at the estate. The house was restored under the chairmanship of the architect Franklin Kendall. Alfred de Pass, from 1927 until his death in 1952, donated and bought objects for the Manor house and refurbished it. In 1963 control of the farm was handed over to the Agricultural Technical Service. In 1969 the South African Cultural History Museum, presently part of Iziko Museums of Cape Town, became responsible for the running of the farmstead and historic “Cloete” wine cellar. During 1971 a wine museum was established in a part of the wine cellar by the South African Cultural History Museum. In 1974 this was closed and demolished. In 1975 Hoop op Constantia and part of Nova Constantia were consolidated with Groot Constantia. An adjoining property, Coleyn, followed in the early 1980s. The Groot Constantia Control Board was established in 1976 to take charge of the viticulture on the farm. In 1984 Groot Constantia and Hoop op Constantia were declared National Monuments. In 1993 ownership of the entire estate was transferred from the government to an independent company named Groot Constantia Trust NPCRF. The main aim of the Trust is to preserve and maintain the cultural heritage of the estate for posterity. From the above it can be deduced that the current Groot Constantia is a continuation of the going concern started by Simon van der Stel. In 2004, Groot Constantia received another significant endorsement when an American citizen picked up a piece of glass on the beach at Lewes, Delaware on the east coast of America. The piece of glass, which was found among other porcelain items, had the inscription "Constantia Wyn" on it. 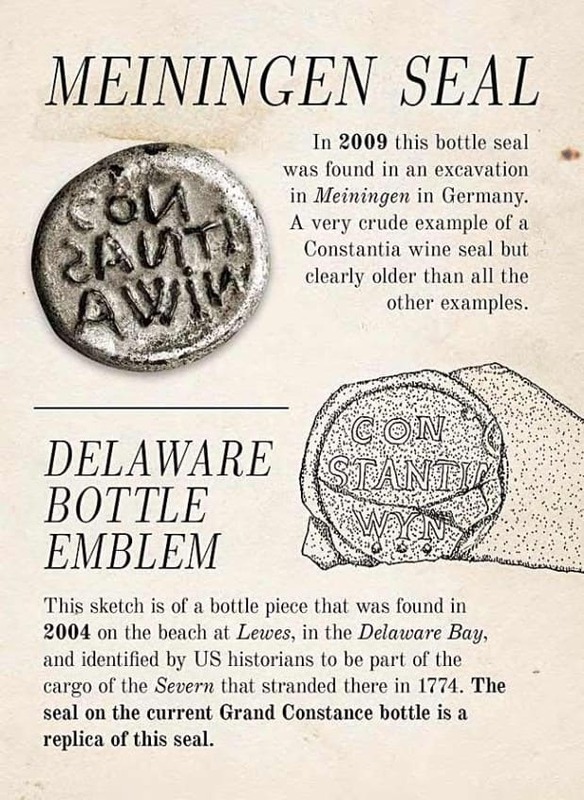 American historians traced this artifact to a British supply ship named the Severn that sank in the Delaware Bay in 1774 after being hit by a storm. The wreckage was only discovered in 2004. Unfortunately the bottle of Groot Constantia wine was broken during the storm and except for the engraved inscription, the bottle offered no other clue as to what had been inside. It was probably one of the sweet wines that Constantia was known for at that time. Jean Naudé, General Manager of the Estate, was invited to a formal ceremony in Lewes where a certificate signed by the Secretary of State of Delaware, Harriet Smith Windsor, was handed to him. 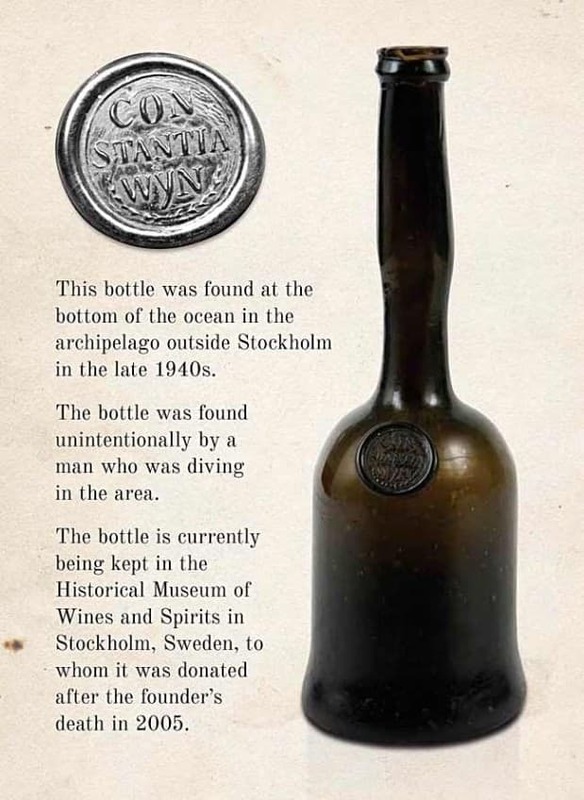 To commemorate this discovery, the Grand Constance wine bottle carries a replica of the inscription on the glass artifact found on the beach at Lewes. The Grand Constance is a continuation of the wine made during the 1700 and 1800’s that made Groot Constantia world famous. The accolades received by the Grand Constance wine affirm that the Groot Constantia Wine Estate is living up to the vision of our founder, Simon van der Stel, and upholding his legacy. Since 1685, when Simon van der Stel arrived in Table Bay and land was granted to him, until the last renovation on the farm, 330 years of history has taken place. Take a journey back in time with us as we explore these important dates. 1685 Land is granted to Van der Stel, which he names Constantia. 1699 Van der Stel retires as Governor of the Cape. 1712 Simon van der Stel dies. 1716 Oloff Bergh becomes owner of a part of the original Constantia, popularly referred to as Groot Constantia. The two other parts, Bergvliet and Klein Constantia, become the property of Pieter de Meijer. 1724 Bergh’s wife, Anna de Koningh, becomes the owner of Groot Constantia. 1734 Carl Georg Wieser buys Groot Constantia from the estate of De Koningh. 1759 Jacobus van der Spuij buys Groot Constantia from the estate of his late stepfather. 1795 The German poet Friederich Gottlieb Klopstock composes Der Kapwein under Johannesberger, Kapwein being Constantia wine. 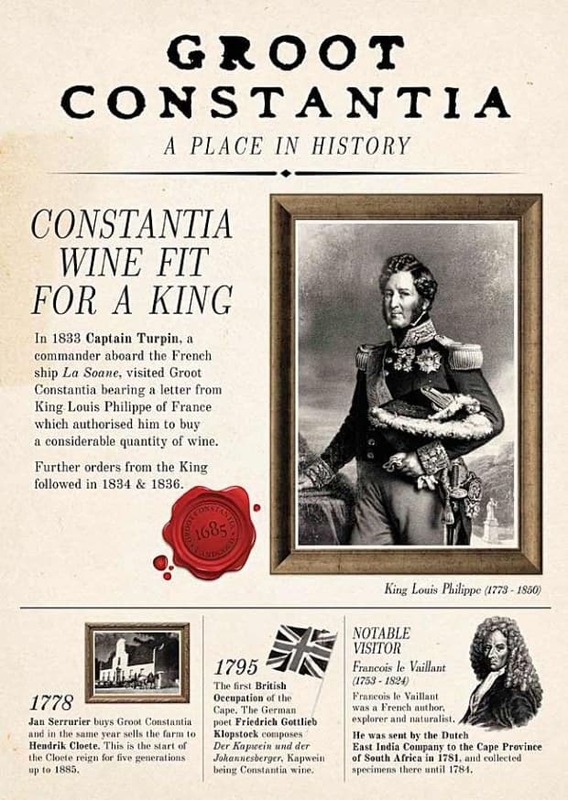 1833 Louis Phillipe (King of the French) becomes the biggest buyer ever of Groot Constantia wine. 1855 Silver medals are awarded to Groot Constantia wine at the Paris Exhibition. 1859 The fungal disease oidiumtuckeri, also known as mildew or powdery mildew, is discovered in the Cape vineyards. In December it is also found in the Groot Constantia vineyards. 1866 The vine disease phylloxera, caused by an insect called peritymbiavitifolii, ravages the vineyards of the Cape, including those of Groot Constantia. 1925 The homestead and the bulk of its contents are destroyed by a fire. 1926 The homestead is restored under the chairmanship of the architect FK Kendall. 1927 The homestead is opened as a museum, and Alfred Aaron de Pass starts donating and buying items for the homestead until his death in 1952. 1936 The homestead, with areas surrounding it and all objects thereon, is proclaimed a National Monument by the Minister of the Interior according to Section 8 of the Natural and Historical Monuments, Relics and Antiques Act, 1934, (Act No. 4 of 1934). 1969 The South African Cultural History Museum becomes responsible for the running of the homestead and the wine cellar. 1971 The Wine Museum is established by the South African Cultural History Museum in a part of the wine cellar. 1976 The Groot Constantia Control Board is established, which replaces the Department of Agricultural Technical Services as viticultural body on the farm. 1984 The Groot Constantia State Estate, including the Groot Constantia and Hoop op Constantia homesteads and all the outbuildings thereon, are declared a National Monument by the Minister of the Department of National Education according to Section 10 (1) of the War Graves and National Monuments Act, 1969 (Act 28 of 1969). 1993 The Groot Constantia Trust, an association incorporated under section 21 of the Companies Act of 1973, is established, which replaces the by now disbanded Groot Constantia Control Board. The Groot Constantia Trust becomes the sole owner of the farm. 1993 The historic bath, homestead, Jonkershuis complex, and wine cellar are restored by architects Revel Fox & Partners. The project is completed in 1994. 1994 Restoration of the pediment gable of the Cloete cellar. 1996 Restoration of the graveyard. 1997/8 Renovation to Hoop on Constantia.